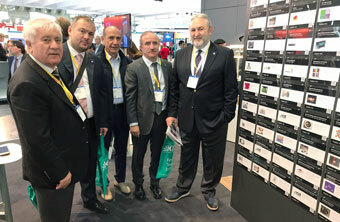 The Istanbul Chamber of Industry (ICI) participated with members of the ICI Board of Directors in the "Hannover Messe", an annual event that is known as the world's largest industry fair. Adnan Dalgakıran, ICI Vice Chairman, Sadık Ayhan Saruhan, Board Treasurer, as well as board members Nahit Kemalbay, Ali Eren, Nurhan Kaya and Serdar Urfalılar took part in the event organized on April 24-28, 2017 in Hannover, Germany. As in the previous year, Hannover Messe 2017 will host sessions that will focus particularly on the potential value that Industry 4.0 will add to the industry. The other key topics of the fair are learning robots, and technological solutions for sustainable energy. In recent years, Turkish companies have begun to show a great interested in the fair, which has been organized since 1947. Approximately 180 Turkish companies will take part in the fair this year, with a significant portion of those engaged in machinery and metal processing industries. Enterprise Europe Network, which has been operating within the Istanbul Chamber of Industry since 2008, is organizing bilateral meetings as part of the fair, with a focus on commercial and technological collaboration. These meetings, named B2Fair, will see 58 Turkish companies from the ICI organization this year, while the fair itself will attract around 6,500 participants from 70 countries. Whilst carrying out a series of reviews and bilateral meetings as part of the fair, the ICI Committee is consulting with its international counterparts on what can be done to grow and develop Turkish industry. The ICI Committee will also meet with officials from the Luxembourg Chamber of Commerce, which is organizing the B2Fair within the Enterprise Europe Network. Hannover Messe’s theme for this year is “Integrated Industry - Creating Value”. 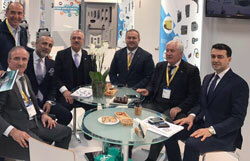 The fair, which will comprise seven specialist fairs in the Hannover Exhibition Center, will focus on the areas of industrial automation, hydraulic-pneumatic and fluid power systems, digital factories, energy, compressed air and vacuum technologies (ComVac), industrial subcontracting, and research and technology, and host a variety of Turkish companies that produce in these fields, including ICI members in particular. During the fair, 6,500 companies from 70 countries will introduce their products and services to 200,000 visitors from 80 countries. Hannover Messe will also welcome executives of small and medium-sized companies, as well as CEOs of global players such as Apple, Foxconn, Microsoft, and Volkswagen. Among Hannover Messe visitors, 95 percent are business professionals, 68 percent are key decision-makers and 44 percent are executives. Approximately 52 percent of visitors visit the fair to seek new suppliers, and almost one third of all visitors are coming from abroad.